If there’s one thing Japanese DJ Hito knows — it’s Sake. It was her love of the traditional rice wine that cemented her relationship with techno don Richie Hawtin, alongside her outstanding DJ skills and formidable record collection, and has seen her spin with Hawtin at his famed ENTER. parties since 2012. She’s back and forth to the White Isle throughout the summer this year — despite ENTER.’s departure from Space at the end of last season — spending time between her home in Berlin and multiple festival dates around the globe. It was in the German capital that the passionate vinyl-only DJ first fell in love with techno, after relocating from her native Japan in 1999 in search of new horizons and musical inspiration. When speaking of influences she cites Music On bossman Marco Carola and ex-Deep Dish DJ Dubfire as important artists, as well as the “the technicality and expression of Richie Hawtin". Never one to shy away from her heritage, Hito always performs in a silk Kimono and traditional Japanese attire, as well as sporting a pair of cute, customised headphones complete with black bunny ears. A big fan of travelling and exploring new cultures, the talented DJ also has a gift for languages — she’s fluent in English, German and Italian, with Korean and Spanish on her horizon. Pretty impressive, right? Couple that with the thousands of views she’s racked up on her live Ibiza Sonica streams and it’s not tough to tell why everyone’s tipping Hito as the next big thing in techno. She's lived in many countries, including Berlin, but Ibiza is clearly a place she's hold dear to her heart. "It's an island with a lot of nature. I really like to have synchronicity with nature and my own personal frequency,” she tells DJ Mag. “After I have a hard night, I always go to the north and recharge, like my iPhone [laughs]. You can have a variety of choices on this island, nature and a simple life or a more hard partying lifestyle!" 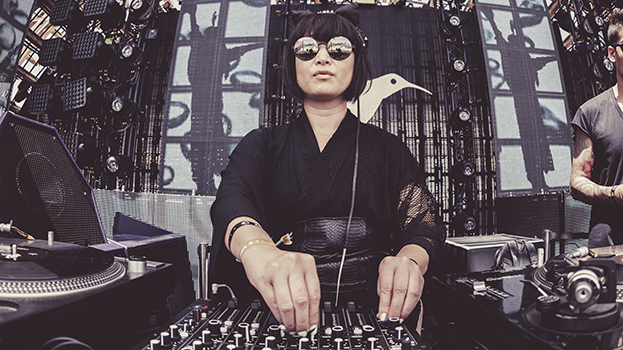 It was Richie Hawtin and his Ibiza-born ENTER.Sake brand that effectively catapulted Hito's name as a DJ into recognition after she became a resident at Space Ibiza in 2012, and as a result she's remained synonymous with it ever since. "I have been a resident of ENTER.Sake since we opened a few years ago. Now we have become our own brand,” she says. “We also do a selection of Sake in Japan, we meet Sake brewers and research the best flavours — just like we do when we listen to music and find the best tracks! We are having more ENTER.Sake adventures than ever before!" For the most part a vinyl DJ — "I have one eight-inch version of Plastikman with his autograph!," she proudly recalls — she's also making waves at other top techno events including Circoloco and Awakenings. Hito and her career are really hitting off.